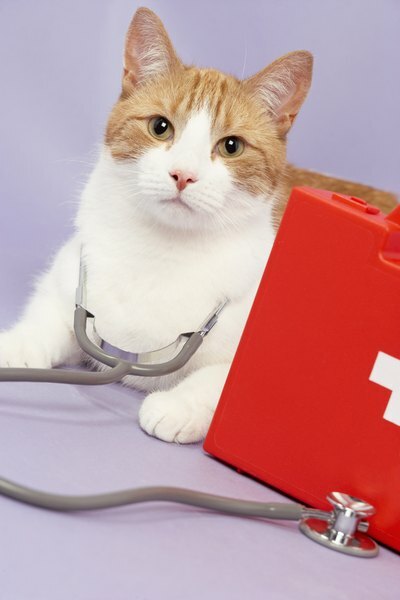 Correctly administering pills can help keep your cat healthy. If your loveable, cuddly kitty turns into a feisty, ferocious meanie when you try to administer her pills, try using a pill gun. This syringe-like device keeps you from getting scratched or bitten and you'll have peace of mind, knowing that your feline friend is getting the medicine she needs. Insert the pill between the lips at the open end of the pill gun. Wrap your cat in a large towel, covering her front and back paws so she can't scratch you or escape and run off. Put your pet companion on a waist-high table or counter top and speak soft, sweet words to her to help keep her calm. Avoid loud noises and views of windows that might display distractions, such as other animals or moving objects. Hold the pill gun as if you're holding a syringe, so your index and middle finger are at the top of the plastic rod and your thumb is on top of the plunger. Alternatively, wrap your fingers around the plastic rod and place your thumb on the plunger, or place your index finger on the plunger while holding the rod with your thumb and middle finger. If you fear releasing the pill too soon, remove your thumb from the plunger. Place your non-dominant hand over your cat's head and gently clench your thumb and middle finger below her cheeks. Pull your hand back so your cat's head tilts backward, her mouth opens up and her eyes face the ceiling. If her mouth doesn't open, use a finger of your dominant hand to pry the center of her mouth open. Avoid prying the sides of her mouth open, because this might trigger an unpleasant encounter with her fangs. Insert the pill gun with your dominant hand as far as you can into your kitty's mouth and push the plunger to release the pill at the back of her throat. Remove the plunger from your cat's mouth, close her mouth and lightly massage her throat to get her to swallow. Alternatively, blow air into her nose to trigger a swallowing motion. Remove the towel from your kitty and reward and praise her for good behavior. To ease the process of administering pills, have a friend hold and comfort your cat while you use the pill gun to give her the medication. If you have trouble administering your cat's pills, consult your veterinarian. You might be able to hide it in your cat's food or switch to a liquid medication. Otherwise, have your veterinarian administer the pills.